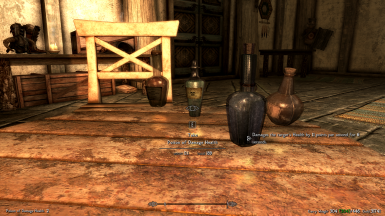 A patch to make Pretty Animated Potions- Small Bottles Edition compatible with Alchemy Potions and Food Adjustments. Alchemy effects from Alchemy Adjustments with the models and textures from Pretty Animated Potions. Requires both mods. ESP-FE plugin file. Alchemy Potions and Food Adjustments Only touches the potions, but works with both the Full version and the No Food version. This is just a plugin file; do whatever you want with it, but check the original mods' permissions on any of their assets (which aren't included here). Skepmanmods for Alchemy Potions and Food Adjustments, dailyplanet for Port of Pretty Animated Potions- Small Bottles Edition (ported by BRSullivan86). This is a patch to make Pretty Animated Potions- Small Bottles Edition compatible with Alchemy Potions and Food Adjustments﻿. Potions will use the models and textures from Pretty Animated Potions while having the effects of Alchemy Potions and Food Adjustments. This also maintains some of the minor non-visual tweaks from Pretty Animated Potions such as increasing the damage of Ice Wraith poison (which only works against ice wraiths), additional effects for Nightshade Extract, and adding them along with Philter of the Phantom to leveled lists. The name changes from Pretty Animated Potions were reverted. Weights were copied over from Pretty Animated Potions- Small Bottles Edition to match the smaller bottle size, and Alchemy Adjustment's new potions were modified to reflect this. The Lightweight Potions addon for Alchemy Adjustments is obsolete and unneeded, with the one exception being the weight for Skooma which this patch doesn't touch.